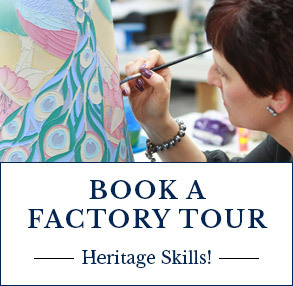 A guided factory tour will take visitors into the heart of the Moorcroft Factory. Based at the Heritage Visitor Centre our expert guides accompany the visitor around the original factory. Comprehensive information in all aspects of the hand made processes of mould making, slip casting, hand turning, tube lining, hand painting, kiln firing and finally glazing. The techniques used in making Moorcroft pottery are virtually the same today, as they were a hundred years ago. Visitors enter a time warp from which they can look into the virtual soul of what must be the world’s best-loved art pottery. 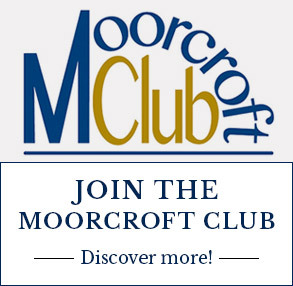 Unfortunately, Moorcroft are unable to offer tours during our annual 'Potters' shutdown for staff holidays. These periods of closure are usually a week at Easter starting with Good Friday, the last week of June and first week of July, the last week of August and during Christmas and New Year. However, 'Potters' holiday dates are subject to movement and therefore we advise you contact the Heritage Visitor Centre to confirm whether tours are available. However, whenever possible Moorcroft will arrange for a demonstration artist to be in the Heritage Visitor Centre at Sandbach Road demonstrating the art of tube lining and hand painting during these periods so that visitors can still see two of the most important skills required in creating a piece of Moorcroft art pottery. Please note from 1st November 2018 to 28th February 2019 we will only be conducting the 11am tours. The 1pm tour will not be available. A maximum of 10 people can be taken on a factory tour at one time. However, large group bookings can be arranged for up to 20 people. Advance booking is necessary at least 2 weeks prior to visiting the factory. To request a factory tour please complete the Enquiry form below, stating your preferred date. On receipt of your enquiry, an acknowledgment email will be sent to confirm your booking. 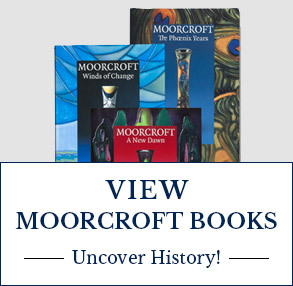 Alternatively, please telephone the Moorcroft Heritage Visitor Centre on +44(0)1782 820515. Guided factory tours are accessible to wheelchair users. For visitors with hearing difficulties we offer the loop hearing system in addition, with prior arrangement, we can also offer to our visitors a signed factory tour.